Fit and Fantastic - what a transformation! 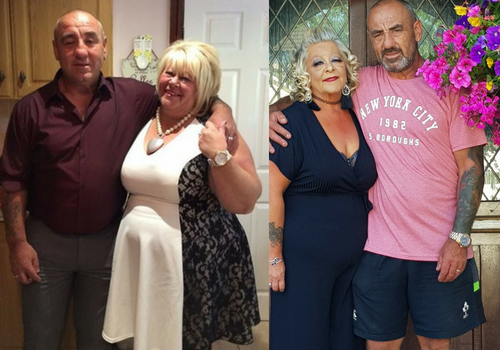 Sharon lost 8 stone and David lost 7½ stone…and it’s been a massive and positive lifestyle change for them! 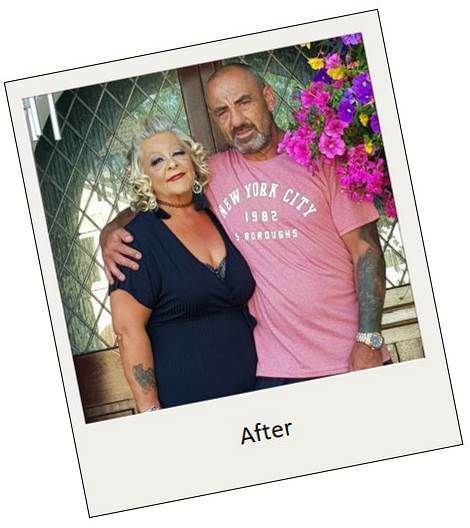 Foster carers Sharon and David have lost an amazing 15½ stone and can’t stop smiling at the huge difference it has made to their lives. “I’d lost all my confidence and couldn’t face going out, so hid myself away,” says Sharon. “Nothing fitted any more and my health was suffering too. I was borderline diabetic, which brought on all sorts of problems, and I was prescribed tablets to try and control things. I just knew enough was enough, I had to do something about it. 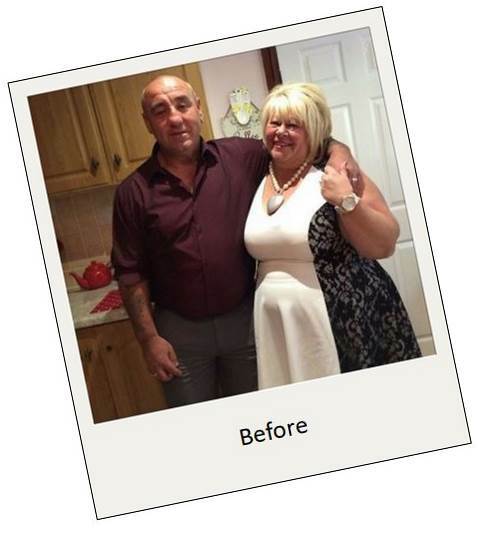 I’d already been to Slimtone before – I knew it worked because I’d lost about 3½ stone. But once I’d got to target I stopped going to class. That was my downfall! The weight piled back on. This time I was determined to stick with it…and stay once I’d lost the weight! I started off going to the Tondu class and started to lose the weight. But the class times weren’t good for me, so I moved across to Bettws which is in the morning and is much more convenient. It’s fantastic. They are such as friendly group of people, very down-to-earth and always looking after each other. Marie is so encouraging, just as Linda is at the Tondu class, and they both have lots of ideas and tips. No matter what, they always make you feel good when you’ve lost weight. Everyone follows Marie’s lead – no-one is judgemental, if things haven’t gone well one week, we support each other and celebrate the next week when the pounds start to melt away. As a foster carer, there are always lots of mouths to feed. I usually make nine meals every evening and we all eat the same. It’s good, healthy food and the lifestyle plan is easy to follow. The cottage pie is one of our favourites – made with turkey mince, which has less fat, and topped with sweet potato and swede mash instead of potatoes. Tasty AND healthy! Pizza is still on the menu too – only on ‘treat’ days and made at home from scratch, but it proves you can still have what you love. The secret for me is to plan and prepare. It’s no good coming in from work at 5 o’clock and just grabbing something from the fridge. Plan for the week ahead and it’s so much easier. I make sure my husband has a filling, healthy and satisfying lunch-box to take to work too. It’s certainly worked for us. We’re both so much fitter and love being out and about. Before we lost the weight we could hardly get ourselves up to take the dog out. Now we’re always out walking with the dog, we go swimming, David is out on his bike and we just love it. The biggest plus is our health. There’s now no sign of the diabetes. I don’t take any tablets and all my checks have been clear. That’s a massive, massive plus. Of course, being able to wear whatever clothes I want is great too. I have some lovely clothes and have even had some of them taken in so that I can still wear them – but wow, I feel so good in them! We’re off on holiday to Mexico next year and I’m so thrilled to be able to wear anything that’s in my summer wardrobe! Slimtone has made such a difference to us both. More energy, more confidence, more get-up-and-go! I know that the hardest part for so many of us is walking in through that door for the first time. All I can say is just go for it. Behind that door is Marie and some amazing people, just like you. They are so friendly, so encouraging, it’s like having an extra family all on your side.